I have reviewed the other two books in the series, Sleeping Giants and Waking Gods, when I first started my blog. The Themis Files has become my favourite series (after Harry Potter of course!) and I am so happy to say that the final book did not disappoint. I was worried that the story would not be the same without my favourite character (the interviewer) but new character, Katherine, was introduced and she added a lot to the story. Only Human is the only book in the series where part of the story takes place on another planet, and I loved reading those sections! This strange planet was so different from our own. It was interested to read about the aliens customs, animals, language, etc. Neuvel created his own alien language and it was brilliant! I appreciated that Only Human delves more in to current world issues than the other books in the series. There is a focus on race relations, Islamophobia, the conditions of refugee camps, etc. There is a lot less action in Only Humans, but I personally did not find that I missed it. In the end, most of the questions that I had were answered, and I was satisfied! I actually shed a tear when I closed the book because I was sad to see my favourite story come to an end. 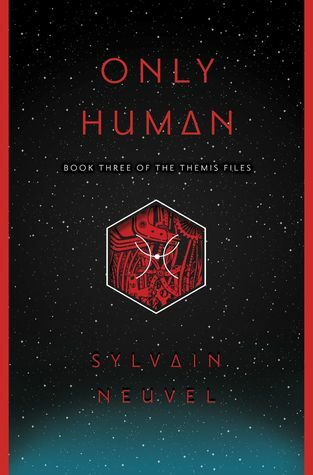 I cannot wait to see what Sylvain Neuvel writes next! If you love mind-blowing books that keep you on the edge of your seat the ENTIRE time than this is the book for you! A lot of the science fiction that I read has to do with space and aliens, so Dark Matter was out of my comfort zone. I am so happy that I gave this book a chance because I absolutely loved it! 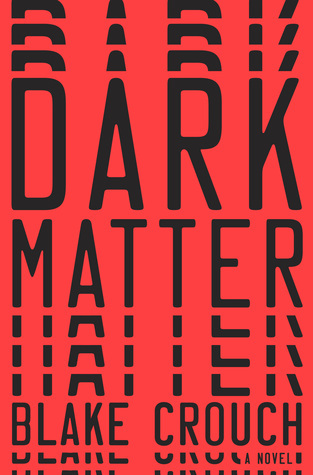 Dark Matter is so fast-paced and I hated having to put it down. When I was not reading it, I was thinking about it. I needed to know what the heck was going on! There was a lot of science talk that I did not fully grasp, but I do not think that you need to in order to enjoy the story and ultimately understand what was happening in the end. The writing is simple and nothing special, but it didn’t need to be for this story to work. The only part I am not so sure about is the ending, I completely understand why it ended that way but I guess I was hoping for something different. All in all, Dark matter was exciting and brilliant! So many twists and turns that I never would have predicted. Pick this up if you are looking for something that you can read quickly, will have your heart racing, and put your brain to work! A year ago I never would have thought that I would become such a huge fan of Science Fiction novels! I only picked up The Themis Files because of my fellow bloggers and I will always be grateful for that. If you are looking to get in to the genre either of these books are a great place to start! If you know any book that is similar to Dark Matter please let me know in the comments. My One Year Blogiversary + Giveaway!! Thank goodness book 3 lives up to the rest of the series. This one is next up on my TBR and I’m even more excited. Awesome! I can’t wait to see what you think about it! You’ll hear about it, for sure! Ah I really hope you love it! I always get excited when I hear someone is reading Sleeping Giants! Ah it is so so good! Thank you! I’m really happen that you enjoyed Only Human! I have yet to read the second book to the trilogy, but I can’t wait…especially since I loved Sleeping Giants so much! I think Waking Gods is my favourite book in the series! I am looking forward to your thoughts on it! Dark Matter was so good! And I haven’t gotten to Only Human yet, but I am happy to hear that you felt it was a good conclusion – both other books have been great so I have been hoping for a solid finish. I was so happy with Only Human! Such a fantastic series! I looooove Dark Matter!! I am glad you enjoyed it! As you said, it’s fast paced, especially the last 100 pages was totally unputdownable!! It’s my jam absolutely. I have never read a book that made my heart race as much as Dark Matter! I just added the Themis Files books to my TBR list recently. They sound really good! I’m so-so on sci-fi in general. I typically like fantasy way more, but there’s some sci-fi out there that I enjoy. I usually like it as long as it doesn’t get too tech-heavy. Ah I hope you love The Themis Files! It definitely is not too tech heavy because that really isn’t my thing either! Dark Matter has been on my shelf for months I think it’s time t pick it up, great review, thank you!! I don’t know many people who love Themis Files hat’s why I’ve been hesitant to read it. But I think I’ll give it a chance! Ah I think you are going to love Dark Matter! The Themis Files is so unique so I know it won’t be for everyone but the people I have made read it so far have also loved it! I’m gonna try it. The idea seems very interesting! I loved both of these! Great review. Great reviews! I loved Dark Matter! It’s such a great premise and a wonderful execution. I just finished Only Human and I gotta admit I’m a little disappointed. I think I just expected more after having read and loved Waking Gods. Thank you! Dark Matter was fantastic! Waking Gods is my favourite of the series but I really did love Only Human! Yeah I think Waking Gods is definitely still my favorite in the trilogy. I look forward to whatever else the author writes though! I recently finished Only Human and ALL OF MY FEELINGS. RIP Interviewer, I’m still crying over his death. But overall I’m so satisfied with the series too! I might’ve shed a tear at the ending too, but the way it comes full circle with Sleeping Giants. I’M NOT OVER IT. I will be screaming about this book from now until forever and I want everyone to read it! SO GOOD. I hadn’t heard of Dark Matter before but now I’m curious and definitely going to be looking it up! Thanks for reviewing it! Only Human was not quite the same without the Interviewer but it was as good as it could have been without him! The entire series is so amazing! I want everyone to read it too! Ah I think you will love Dark Matter! Agreed! I really do hope more people read it~ I first discovered it on Twitter so social media really is a great way to learn of new books! I’ve had Only Human since it came out, but don’t want to start it yet because that means the series will end! I loved the first two books so much, and don’t want it to be over 😦 But I’ve heard so many good things and can’t wait to experience it for myself, haha. I’m torn! I completely understand! I am so sad that the series is over! I can not wait to see what he writes next! Dark Matter is so fantastic! Dark Matter is one of my top 5 favorite books of all time! Side Life by Steve Toutonghi is pretty similar to it in that there are elements of quantum physics and messy timelines if you’re interested 🙂. Dark Matter is so good!! Ohh I haven’t heard of that book before. Going to have to add it to me TBR! Thanks!